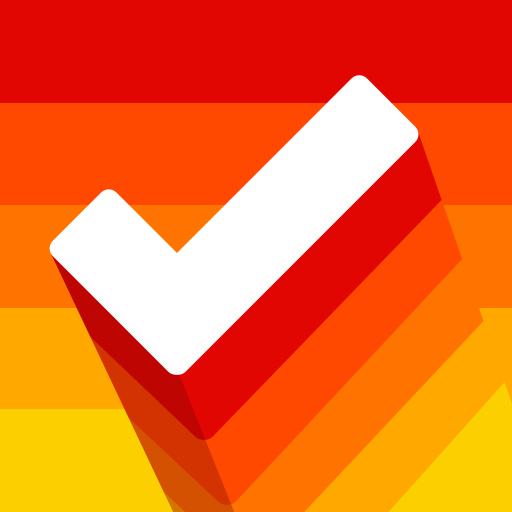 Task ($0.99) by Nuage touch is basically what Clear should have been. Earlier this year, Realmac Software and Impending had teamed up to bring us Clear. 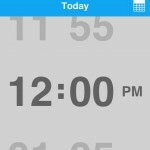 While the app offered a very pretty face and trendy multitouch gestures, Clear was really nothing more than a list. You could not set reminders or even due dates — you were only able to make simple lists of what you needed to remember to do. 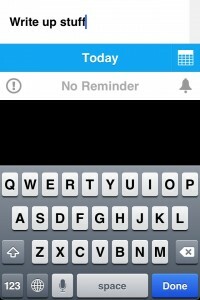 Fortunately, there is now Task, which retains the basic look of Clear while adding a lot more functionality to it. When you launch the app, you'll immediately be greeted with a short tutorial on how to use the app (with a "folding" surface that looks like the fold-to-unlock jailbreak tweak). Once you get past the welcome screen, several sample tasks will be waiting for you. 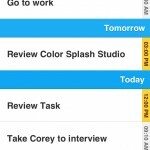 If you’ve at least tried Clear, then using Task should feel natural. 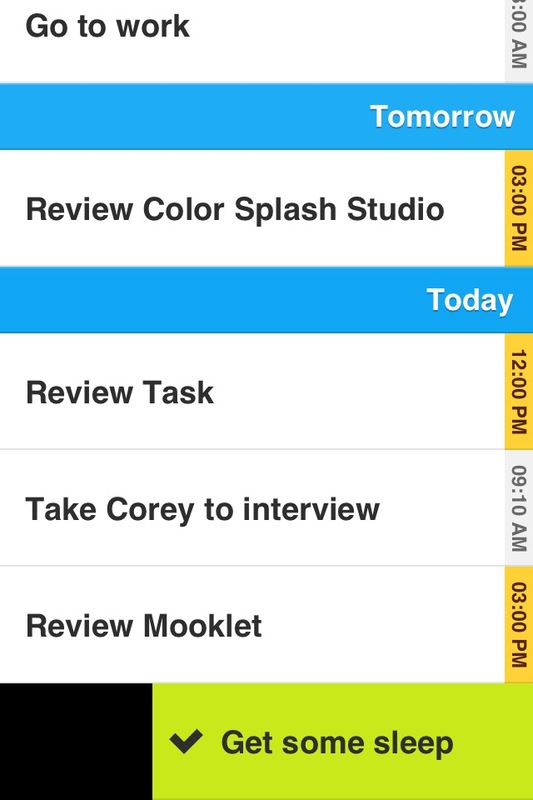 But if not, then the sample tasks will help you understand the basic techniques used in the app. 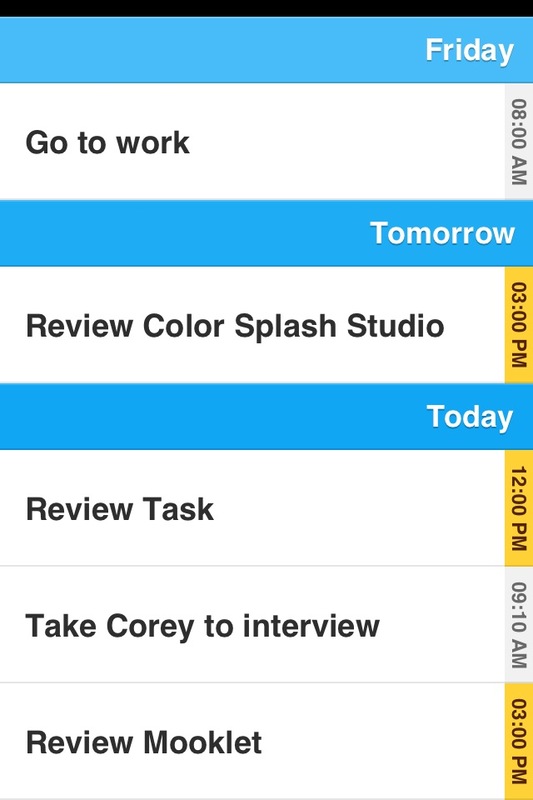 Task items will be in the large white spaces, with different time sections divided by a bold blue bar. You can pinch apart anywhere in the list to create a new item, swipe to the right to complete, or to the left to delete, tap-and-hold to reorder, and tap to edit. If you want to see the completed items, just do a “long-drag” from the bottom of the screen. Long swipes on completed items will restore it, and just do another long-drag from the top of the screen to return to the present. 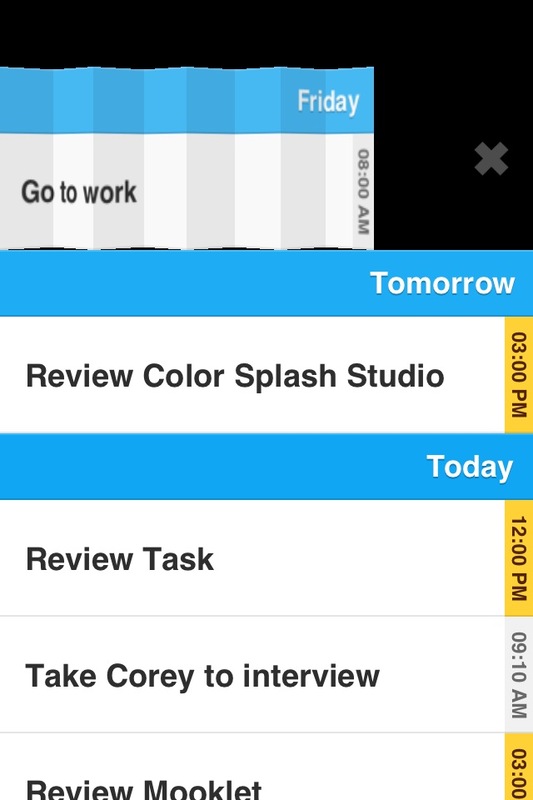 When you’re on an empty list, tapping anywhere on the screen will allow you to create a new task. If the list is filling up the screen, you only need to pull the screen up a bit to bring up a new task space. 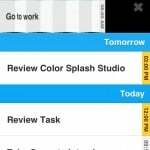 Unlike Clear, when you create a new task, the rest of the app disappears so you are focused on adding a new todo. There are also two other options available for a new assignment: priority and reminder. If it’s important, make sure to tap on the exclamation mark — this will add a yellow highlight to the item to indicate its significance. 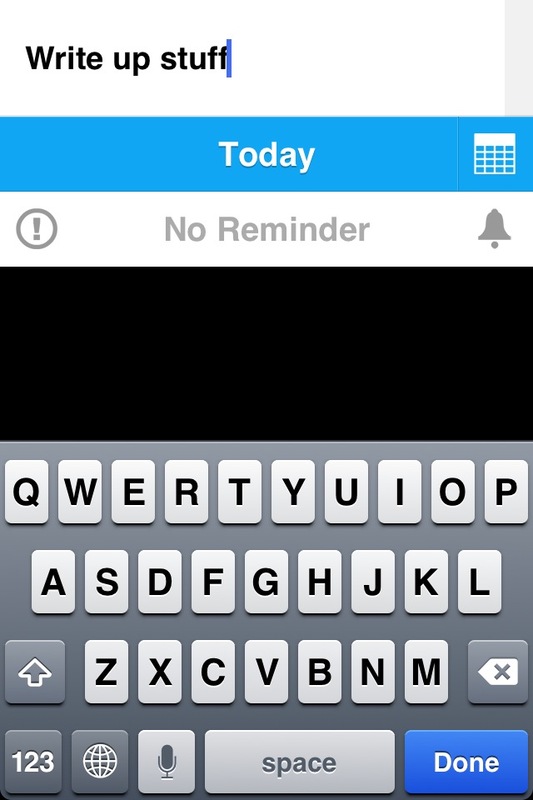 And for those tasks that need a reminder during the day, just tap on the reminder area and you get a large time picker and button to access the calendar. 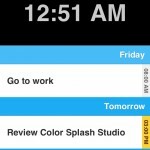 Tasks with reminders will appear in the timeline with the time on the right edge. 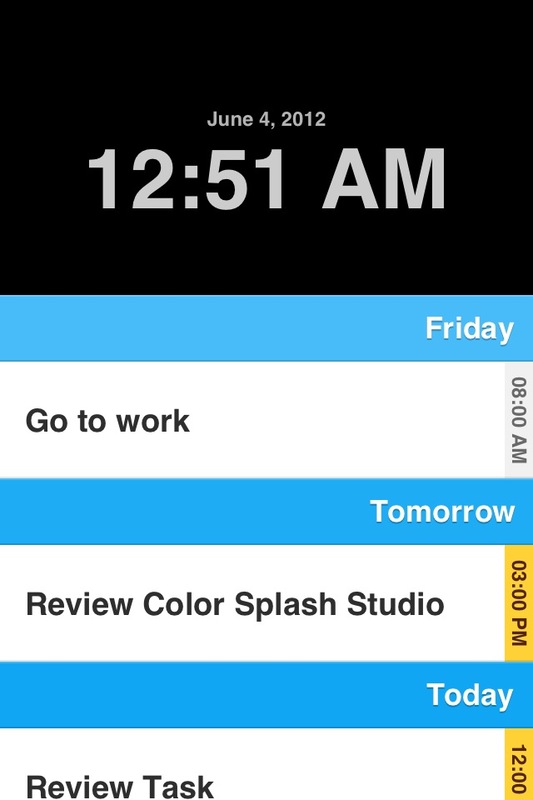 Once a task is saved (tap anywhere to exit the editing view), it goes in the “timeline” view. 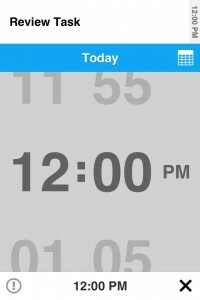 With the timeline, Task decided to do something different — tasks for “Today” will appear at the bottom, and other tasks that are due later will appear on the top. 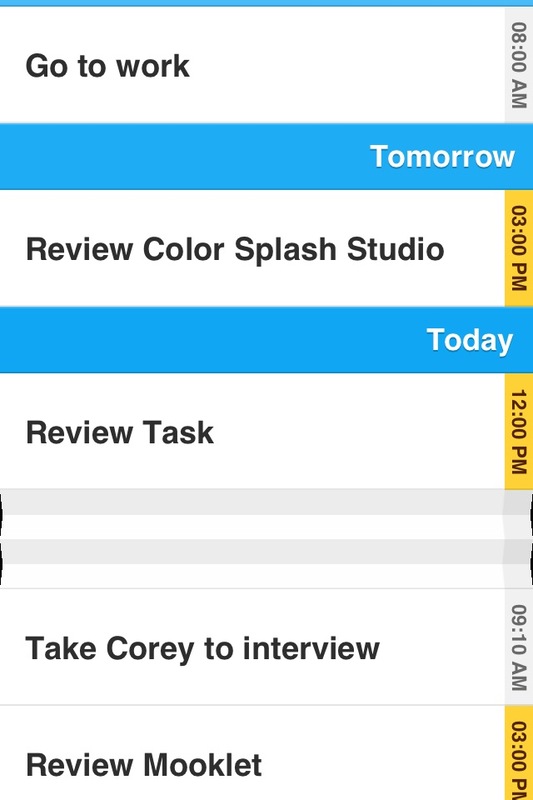 It is basically a descending version of what we’re probably used to in most task apps. 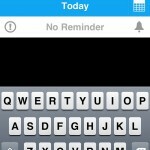 The blue divider will also be darker at the bottom, and get lighter as you go higher to signify priority. It’s definitely clever, but may take a bit of getting used to. 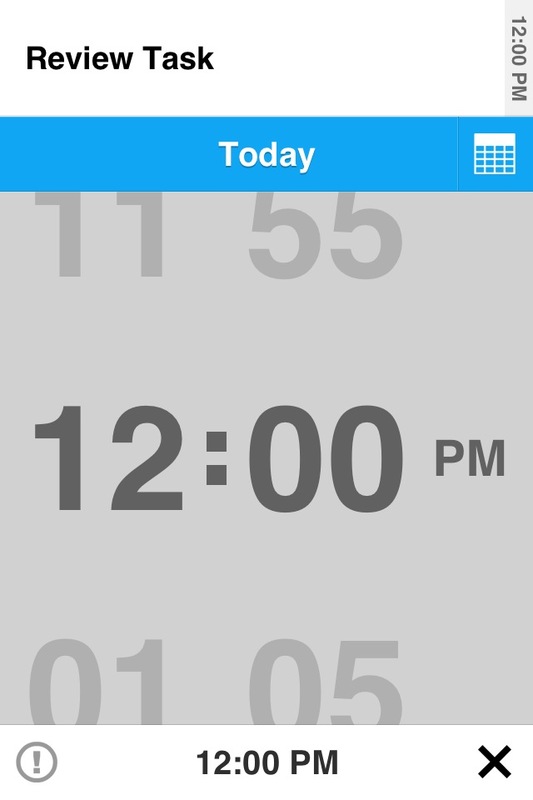 With a simple pull downwards from the top of the screen (in the present day view), users will be able to see the date and time. This is a great finishing touch to a complete task manager, since you were unable to view such information in Clear. 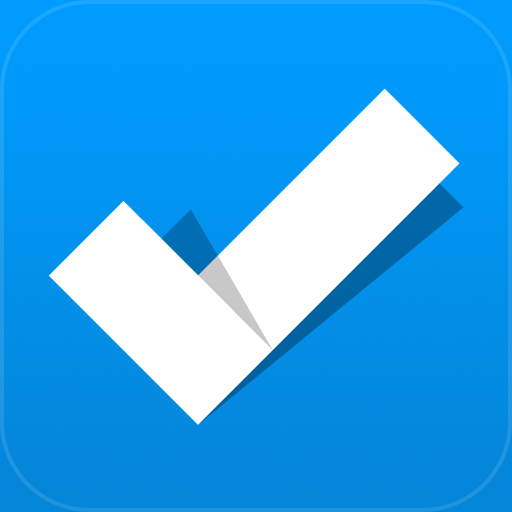 Overall, Task is a great and simple task manager since it retains the same feel and look as Clear, but offers the missing functionalities that users were looking for. However, there is still room for improvement. 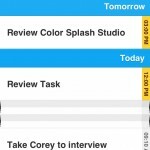 Since Task already offers prioritizing and reminders, they could also implement a notes section for tasks. If the Steps app could do it, then I'm sure that it can be added to Task as well. It would also be great to see a syncing solution in the future (Steps can integrate with Google Tasks or iCloud), as well as a universal version. 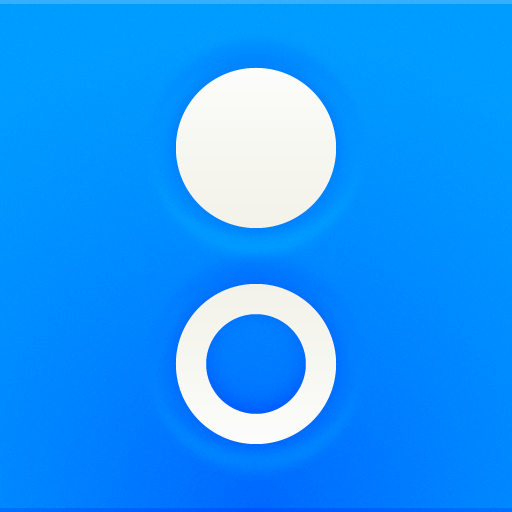 If you liked the manner of Clear but wanted more from it, then take a gander at Task. It's available for $0.99 in the App Store.